Jerry Colangelo and USA Basketball is painting this wonderful picture of how the 12-man U.S. men’s national team was constructed but take a closer because the picture is revealing something else. In a team photo, Dwight Howard – the Orlando Magic center who wears the adidas brand – is placed at the far left craddling a ball with his left hand conveniently covering the Nike logo on his shorts. Coach Mike Krzyzewski, the only one seated, has his left foot covering Howard’s sneakers, which probably does not say Brand Jordan or Air Zoom. It’s not the first time an NBA player tried to hide a sponsor’s logo in the Olympics. Remember the 1992 Dream Team. To avoid being seen wearing anything but his beloved Nike gear, Michael Jordan draped himself with the American flag. Charles Barkley did the same thing. Colangelo, USA Basketball’s managing director who called the selection process for the 2008 Olympic team extremely difficult, said the team has good chemistry and balance. Must be just coincidence that 11 of the 12 players on the squad are affiliated with Nike, which just happens to be the main sponsor for Team USA. Also, must be coincidence that the team has one pure shooter (Michael Redd), one true center (Howard) and a truck-load of one-on-one players. Chauncey Billups and Mike Miller, two of the NBA’s best snipers, should have earned spots on the Olympic team. One problem though. They both wear adidas. Miller is easily a better fit for international ball than Carmelo Anthony or Dwyane Wade. Anthony is the Dustin Diamond of USA Basketball. He gets a lot of air time despite having very little credential. Sure he puts up nice numbers on offense but he also brings a ton of heavy baggage. He’s an erratic shooter, can’t play defense and is not a good enough rebounder to play in the post where he’ll end up most of the time since Team USA has one power forward on the roster (Carlos Boozer). Reports say Wade, who is coming off shoulder and knee surgeries and looked overweight during the NBA season, is healthy enough to play. That’s the good news. The bad news is where do you play Wade? Chris Paul needs the ball to be effective. Kobe Bryant and LeBron James need to ball to create offense. Jason Kidd needs the ball to run the break. So, where does that leave D-Wade, who also needs the ball to be effective. When you don’t have long-range shooters in the game, guys like Paul, Kobe and LeBron will have a difficult time probing the middle of the defense because teams will pack the paint. Good luck to Coach Mike Krzyzewski in figuring out how to fit all his square pegs into the round slots. 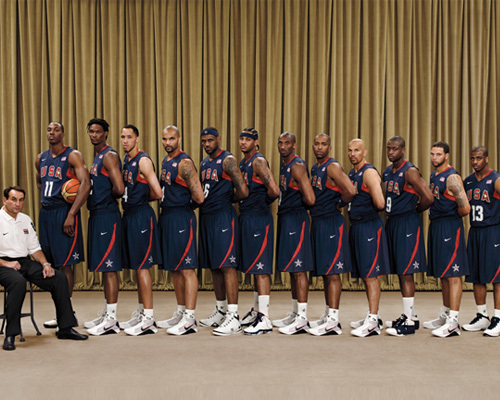 At least Phil Knight gave his stamp of approval on Team USA…or should we say Team Nike. “TEAM NIKE” – That’s a good one. Good catch! Imagine if it was “Team Adidas or Reebok”? Dude, we’d definitely lose! Spain was pretty darn good! Awesome,I admire Miami! They are the top team in the NBA! We will never see another 3 headed monsterteam like this again! Go Bosh! Yeah, I truly adore meelo! He is the hottest dude in bball! Go Knicks! Hello! I’ve been reading your web site for some time now and finally got the courage to go ahead and give you a shout out from Dallas Tx! Just wanted to say keep up the great job!